Comprehensive, intelligent, practical and well-written. Not for beach and bar tourists, but for real travelers. Stilts are one of the easiest ways of getting high, and like many things they’ve been around a lot longer than you think; back to the 7th century bc, Chinese acrobats donned stilts to amuse the first Song emperor. They remained in the entertainment sphere until the 16th century, when they found a practical use among shepherds in the marshy moors of the Landes in western France. The average pair of tschanquayres, as they were known, measured three feet high and allowed the shepherds not only to stay high and dry, but to keep track of their sheep, while indulging in their favourite pastime – knitting. Although tschanquayres became obsolete when Napoleon III drained the Landes in the 1860s and planted them with pines, they soon found a new role in racing and world record breaking. The French still hold some of the most amazing records: Sylvain Dornon, the échassier national (‘national stilt walker) clacked his way up to the second platform of the Eiffel Tower, then ran the 1830 miles from Paris to Moscow on stilts in 1891. Three years later, in the Landes 273-mile stilt race, competitors ran the average speed of 4.4 mph, a pace that awes modern stilt walkers. The ultimate trick, however, was performed before the Prince of Wales in 1897 by the Great Blondon (Jean-Francois Gravelet), who walked across Niagara Falls, on stilts, on a tightrope. Modern stilt walkers often strut their stuff for charity or the Guinness Book of Records. Several current record holders include Emma Sian Disley, who in 1977, climbed Mount Snowdon, in four hours, five minutes, and 45 seconds, and American Joe Bowen, who stilt-walked 3008 miles from Los Angeles, California to Bowen, Kentucky. Size counts, too: current record holder is Doug ‘The Great Entertainer’ Hunt of Brantford, Ontario, who on September 14, 2002, took 29 steps a staggering 50 feet 9 inches off the ground. Having spent my last five summer holidays covered by your guide I can say it is by far the best available. I already possess the 'competition' but nothing gets near to the excellent balance which has been achieved in this volume. It is comprehensive, well-organized and easy to use, containing all the information which a visitor would need to get the most wither from a tour or a longer stay in a location. The style is lively and accessible and unlike so many travel books opinions are rightly critical of certain places... if proof were need of the inspirational nature of the guide, I have just made bookings with Brittany Ferries for this summer's expedition to Gascony. 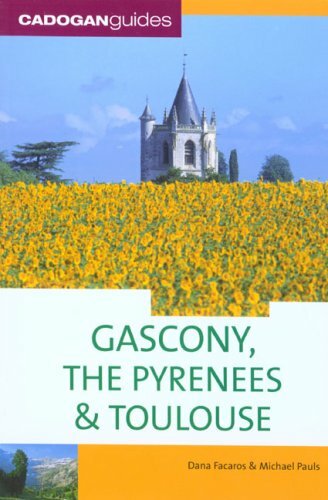 I have just read your guidebook 'Gascony and the Pyrenees'. As a regular and fairly frequent traveller to the region, over many years, I find it outstanding, packed full of valuable advice & on many subjects.